Why do geologists see nothing? This is due to the geological glue, which, though artificial, is seen by the geologists either as an impurity, and therefore useless to study, or as a natural binder. At best, the analysis tools and the working methods of geologists consider the glue as a perfectly natural “micritic binder”. A geologist not informed of geopolymer chemistry will assert with good faith that the stones are natural. 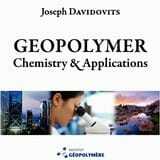 The scientific background, including analysis, formula, stone making, are disclosed in the recently updated book by Prof. Joseph Davidovits Geopolymer Chemistry & Applications, in several chapters, i.e. Chapters 5, 11, 13, 17 and 20. People think that because we use chemicals, it is very easy to find these ingredients in the final product. This is wrong. Thanks to the geopolymer chemistry, the chemical reaction generates natural elements, minerals that can be analysed as natural if scientists are not aware of their artificial nature. During geosynthesis kaolinite clay (naturally included in the Giza limestone) first reacts with caustic soda (see chemical formula 2). To manufacture this caustic soda, one uses Egyptian natron (sodium carbonate) and lime (coming from plant ashes) (see chemical formula 1). The so obtained caustic soda, NaOH, will react with clay. The most interesting point is that this chemical reaction creates also pure limestone (calcite) as well as hydrosodalite (a mineral of the feldspathoids or zeolites family). But, the mixture is still quite caustic. In order to neutralize it, one adds a special salt called carnallite (magnesium chloride) easily found in evaporites, in saline deposits like natron but not at the same place (see chemical formula 3 and 4). Alkalis have been transformed into neutral salt halite, which explains the high content of NaCl found in pyramid stones. Naissant calcite and magnesite may combine to form rhombohedral crystals of dolomite. In the chemical formula 2, the clay may be replaced partially (or entirely) by hydrous siliceous mineral varieties, such as diatomaceous earth (hydrated amorphous) yielding sodium silicate (water glass), which will react with carnallite according to chemical formula 3, and formation of magnesium silicate. The re-agglomerated stone binders are the result of these geosynthesis (geopolymers) that create several natural minerals: limestone (calcite), hydrated feldspars (feldspathoid, mica-chlorite), magnesium silicates, magnesite (also dolomite resulting from magnesite+calcite) and halite. Egyptian natron often contains Na-sulfate that yields the formation of Ca-sulfate. We understand why geologists can easily be misled. Imhotep had two different chemical formulas: a very simple one for the casting of the limestone core blocks, and another one to produce the high quality stones of the exterior layer. When all the blocks of the core were set in place, a layer of casing was applied. This meant preparing a more sophisticated type of mold to produce inclined limestone blocks following the slope of the pyramid, adding new ingredients to the mixture to yield a higher quality stone. To build the Step Pyramid, Imhotep located a quarry of soft limestone, just one kilometer from the construction site to provide the raw material he needed to cast millions of modular stones. Soft limestone can be easily disaggregated either under pressure or by diluting it in water. Shallow canals were dug in the soft limestone along the Nile, forming ideal basins for producing large quantities of muddy limestone. Imhotep’s men began disaggregating the clayish soft rock with its water, until the lime and the clay separated, forming a mud with the fossil shells at the bottom. The mixing of lime, Natron, limestone and water. Next, a substance called Natron salt (sodium carbonate) was poured in. Salt is a very reactive substance that has a petrifying effect, which is why it is used to avoid the putrefaction of organic tissue (mummification). Natron is found in very great quantities in the desert and in Wadi-El-Natron. More lime, the mineral which binds, was added. Lime is a powdery residue obtained by burning and reducing to ashes sedimentary rocks such as limestone and dolomite. The fire oxidizes and converts the rocks into a powdery residue, and that is lime. The ashes of plants are also rich in lime and the priests established the custom of receiving ashes from cooking fires from all over Egypt, to add them to the mixture. Lime mixed with natron and water produced a third substance, a much more corrosive one, that sparks off a strong chemical reaction and transforms other materials. The water dissolved the Natron salt and put the lime in suspension, forming caustic soda. Caustic Soda is the catalyst Imhotep needed to trigger off a powerful chemical reaction, one which would produce the fast integration of silica and alumina. The leveling of the second mold. Men mixed the ingredients in the canals until a homogeneous binder paste was obtained. Imhotep had invented a water-based cement. Now, he had only to convert that cement into concrete. His workers added more fossil shells, limestone rubble and silt from the river Nile, producing a concrete paste, which they carried up to where hundreds of small wooden molds had been prepared. These molds had been smeared with rancid oil to facilitate the release of the concrete once hardened. The mixture was rammed into the molds as in the making of the packed earth called pisé, becoming a dense re-agglomerated limestone, which was let to dry in the shade, to avoid its cracking under the glare of the hot sun. The filling of the third mold. The hardened blocks were released from their molds and easily carried up to the construction site, by means of small ramps over the tiers already set, until the men placed each block in its correct place. The towering Step Pyramid was not only the first, but also the only one made entirely of small modular blocks weighing approximately 60 kilos apiece, easily carried by two men. This Step Pyramid was just the first one that simply took the crude brick techniques and, instead of using mud, Imhotep used a limestone paste. Then, the three Sneferu’s pyramids improved step by step the technology by increasing the size of the blocks and the height of the monuments. Whereas the pyramids at Giza showed how technical improvements helped to achieve one of the famous wonders of the world, only 60 years after the first pyramid at Saqqarah. In later times, by Sneferu’s Red Pyramid, at Dashour, much heavier blocks were molded and cast directly on the spot, which means they were not moved. This is how the Great Pyramids at Giza were built. At the Geopolymer Institute, we tried to replicate this masterpiece by making life size blocks, that is to say from 1 to 4.5 tonnes. The next pages illustrate our experience. 1) Nummulitic limestone outcrop (fossil shells), naturally friable, from Tracy-le-Val south of Saint-Quentin (France). It resembles that of Giza but does not contain kaolinitic clay, which has to be added. 2) Into the pool containing two cubic meters of water are poured 160 kg of kaolinitic clay to imitate the Giza limestone, followed by 60 kg of sodium carbonate (natron) and 80 kg of slaked lime. 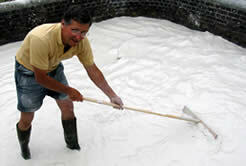 3) The geological glue is mixed with 4500 kg of limestone using a simple wooden paddle. After drying, the final mixture contained between 18-20% weight water. How the pyramid blocks were built ? Does the picture show an artificial or a natural stone? Scientists of the Geopolymer Institute have successfully manufactured and cast a re-agglomerated limestone. The geological material used here is very similar to the one found at the Giza plateau in Egypt, a soft material with lots of nummulitic shells coming from a quarry in France. The purpose of this test was to demonstrate that this type of limestone is perfect for re-agglomeration. We have disaggregated this soft material with water, then mixed the muddy limestone and its fossil shells with kaolin clay, and a simple geopolymeric binder. Then, the limestone mud was packed into the mould (a pyramid shape!). This re-agglomerated limestone, bonded by a geochemical reaction, thus hardened into a resistant block, much harder than the original material. We have strengthened the stone and made it more resistant to pollution, acid rain, and freezing. A close-up of the mini-pyramid. Fossil shells are intact and the geopolymer binder is integrated within the calcite matrix. The mini-pyramid is 9 cm (3.55 inch) large. In these pictures, you can clearly see that anyone who is not aware of the possibility of the geopolymer chemistry can be easily fooled. The final result has not a modern concrete appearance. It is a natural limestone, the material was not crushed but gently disaggregated, and all fossil shells are intact. A close-up of the bottom of the mini-pyramid. The bottom was the top of the mould, the mini-pyramid was cast upside-down. Because we were not authorized to sample original materials from the Giza plateau quarries, we did not used the exact ancient Egyptian formula. The French limestone, used in this experience, is very similar but has no reactive clay in it, and we had to add some. Nevertheless, the final result is chemically and geologically close to what we find in Egypt. With the Egyptian formula, the result is different because it requires bigger blocks for a better cohesion. It is not suitable for small items. Whatever the formula, we have clearly demonstrated that the key of success is an appropriate raw material. …and only to our archeology news!